REACH YOUR TARGET AUDIENCE FACE TO FACE. 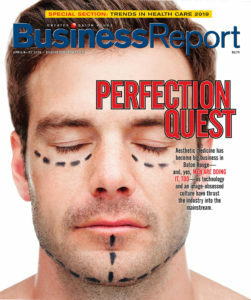 Business Report is the award-winning, go-to source for Capital Region business leaders. In print, online and through in-person events Business Report is the place where business decision makers learn, meet and interact. For more than 35 years, Business Report has hosted events for C-level executives and entrepreneurs. These first-class, high-quality programs offer sponsorships that leverage the effectiveness of marketers’ integrated print and online efforts. As a sponsor, you will partner with Baton Rouge’s premier business publication to gain visibility, goodwill and, most importantly, the opportunity to generate new business! This annual breakfast is an opportunity for business and community leaders to come together and celebrate the best of Louisiana’s Capital Region. Attendance is by invitation only. This event focuses on what is going on in our community and reminds our leaders of the possibilities, opportunities and trends in our region. The Louisiana Business Symposium is full of Baton Rouge pride, recognizing the success of local companies and celebrating the continued economic growth in the Capital Region. TOP 100 PRIVATE COMPANIES LUNCHEON: This special luncheon honors the CEOs of the top 100 private companies in the Capital Region. Economist Dr. Loren Scott, the keynote speaker, unveils the state’s economic forecast. BEST PLACES TO WORK AWARDS BREAKFAST: Baton Rouge Business Report’s annual Best Places to Work breakfast recognizes and honors the best places of employment in the greater Baton Rouge area. The Baton Rouge Business Report started the Influential Women in Business Luncheon in 1997 as a recognition vehicle for the largest and fastest growing revenue-generating segment in the Baton Rouge economy—businesswomen. The Influential Women in Business Luncheon is to support and recognize businesswomen who are a strong and productive force in our community. The Top Forty Under 40 program honors 40 of Baton Rouge’s most dynamic young business leaders under the age of 40 who share a commitment to professional excellence, and to the community. Business Report can help you craft your campaign. To schedule a creative consultation, contact Kerrie Richmond at  421-8154 or via email at krichmond@businessreport.com.